The past few days in the village of Balamposo have been hectic, to say the least. 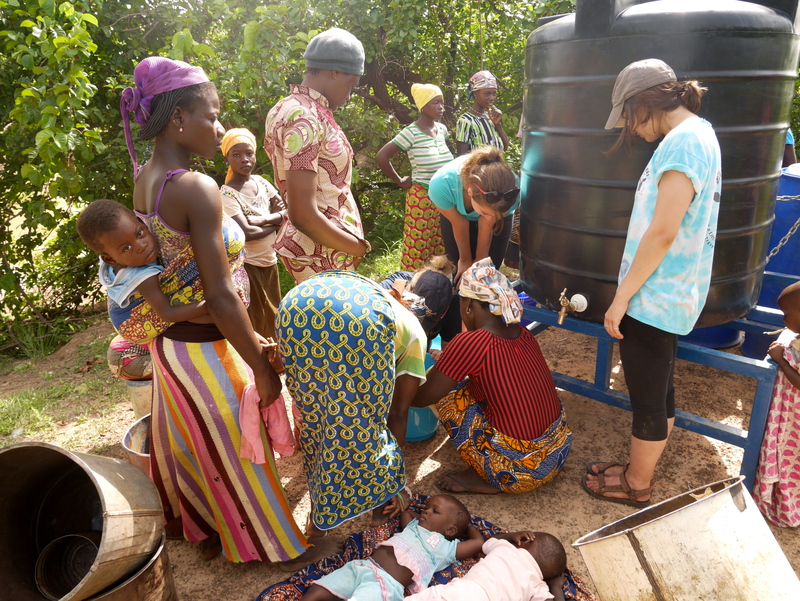 We are almost ready to open up the CWS clean water center! Our two entrepreneurs, Bellamina and Damu, have been so wonderful to work with, and we are confident in their ability to keep the center up and running. 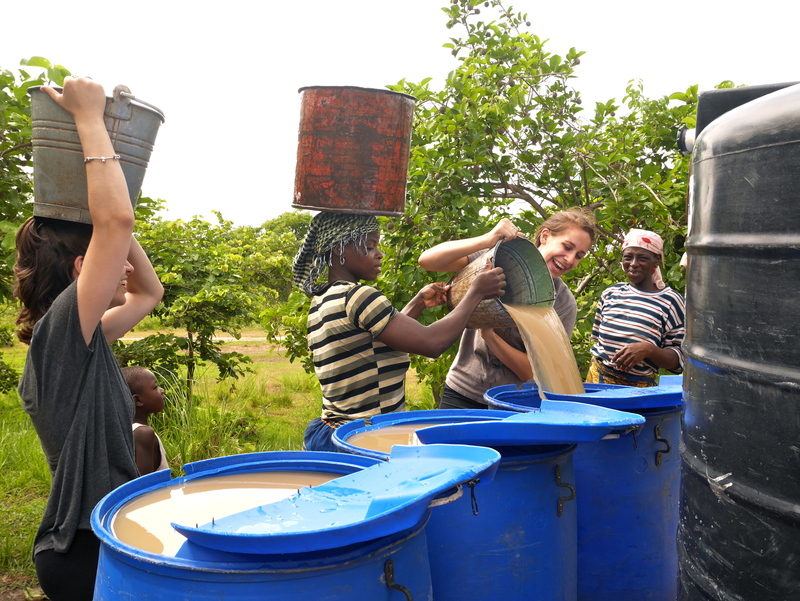 Haley and Julia helpng Bellamina and Damu fill the 200-L Blue drums with dugout water. This is the water that the people in Balamposo are currently drinking. 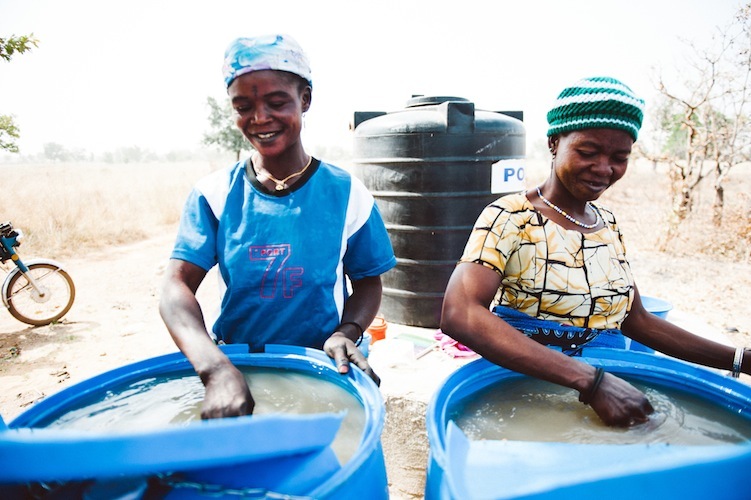 Over the course of two days, we trained Bellamina and Damu in both water treatment and money management. We went into training thinking we would have to answer many questions and provide a lot of direction, but the women have proven to be tremendously intelligent and resourceful. We first demonstrated how to use the drums and polytank of the water center. 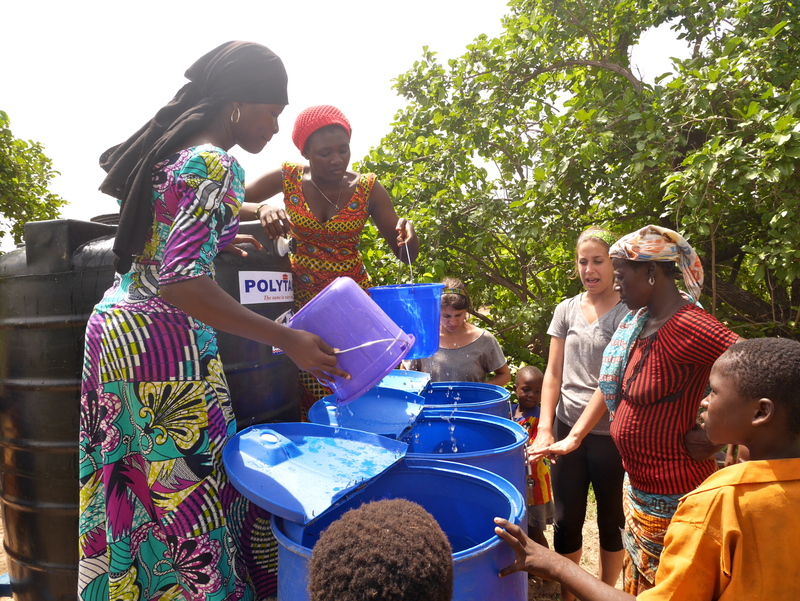 The women of the village are much more skilled then us when it comes to fetching the water and balancing those buckets on their heads! We worked with alum to rid the water of its turbidity and then explained how to use the chlorine tablets to kill all the bacteria in the water. Although working with a translator during training can be difficult, it is obvious that Bellamina and Damu understand everything and are committed to providing a valuable service to their community. 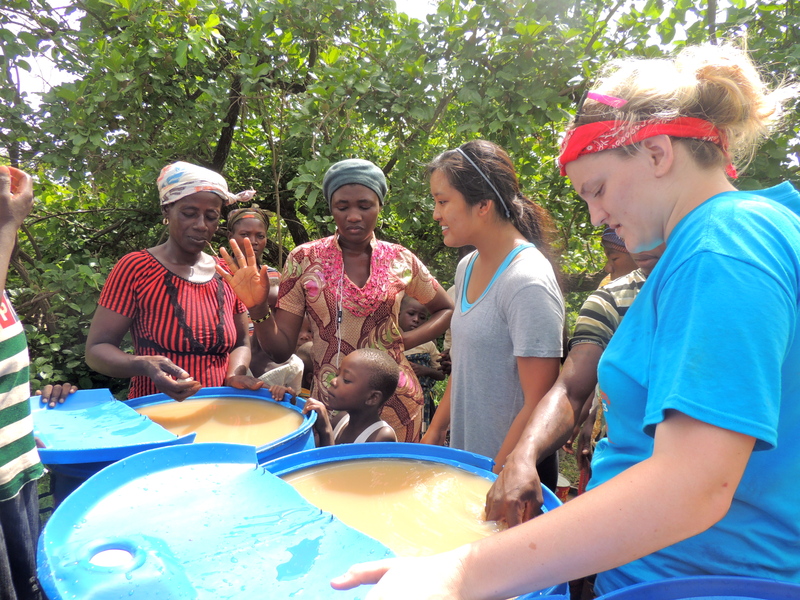 Haley and Caroline teach Bellamina and Damu how to use alum to remove the turbidity from the water. The most incredible part of training these women is experiencing their own innovative ideas and eternal gratitude. Whenever an issue or question would arise, they would debate with the surrounding women and come to a quick solution. The efficiency of problem solving in Balamposo trumps any training we can provide. Additionally, they continue to thank Community Water Solutions despite knowing their own hard work is the key to success. During money management training, we stressed the importance of savings to ensure that all supplies are paid for and that they can adapt the center during changing seasons. Bellamina replied, ‘If we do not commit to this business and we let it fail, it means we do not love ourselves.’ They take their responsibilities very seriously and consistently express appreciation to us for giving them their start. We know that the future of Balamposo’s water center will not be completely smooth—there are bound to be bumps along the road to clean water for this wonderful village. We know that the success of the center will depend on Bellamina and Damu, but we hope that the training has provided them with all of the knowledge they will need. We can’t wait for opening day, when our wonderful entrepreneurs can put their skills to the test! This entry was posted in Balamposo, Global Leadership Program, Implementation. Bookmark the permalink.